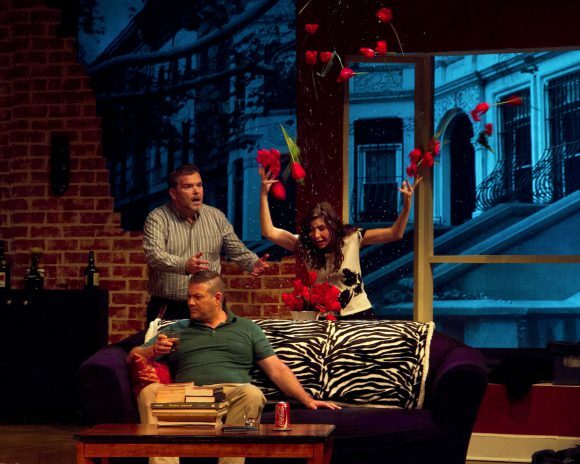 “How many parents, when they’re defending their children, become infantile themselves?” In Ottawa Little Theatre’s God of Carnage, two couples devolve into fits of childishness trying to solve a simple matter of a playground fight. In this play by Yasmina Reza, two pairs of parents meet to discuss a fight between their sons involving an insult, a stick and a couple of knocked-out incisors. But soon Annette, Alan, Veronica and Michael lose all civility as they start to fight amongst themselves. Arguing about things as varied and as insignificant as the use of the word “armed” versus “furnished” and how best to dry puked-on high literature, the play soon becomes not about the fate of the children, but the childishness of the adults. God of Carnage has much the same appeal as reality T.V: we get to be voyeurs to petty domestic squabbles. It’s nice and somewhat comforting to see the conflicts of our own lives reflected onstage. While I enjoyed the familiarity initially, God of Carnage failed to keep me interested throughout the entirety of the show. The 90-minute run time soon dragged on, even after the shock of Annette vomiting onstage about midway through. Every time Annette and Alan got up, got dressed and got ready to leave their hosts’ home in a huff – only to inevitably sit back down for more of the same fighting – I lost more and more interest. Moreover, this play isn’t emotionally stirring nor intellectually satisfying. There is no profound message beneath all the aggression. There aren’t any moments of great levity either, other than the occasional half-witty, half-offensive one-liner. As such, I’m not quite sure where this play stands – it’s not funny enough to be a comedy, nor profound enough to be a drama. It eludes a genre, but only because whatever substance it may have is concealed by a tangled web of many minor conflicts. Of course, some things do stand out. The open-concept set construction is very well done, with the living room, bathroom and kitchen all included. The projector screen also comes in handy, and helps resolve one minor conflict at the very end surrounding the fate of a pet hamster. The actors must also be recognized for their phenomenal job presenting easily recognizable characters. 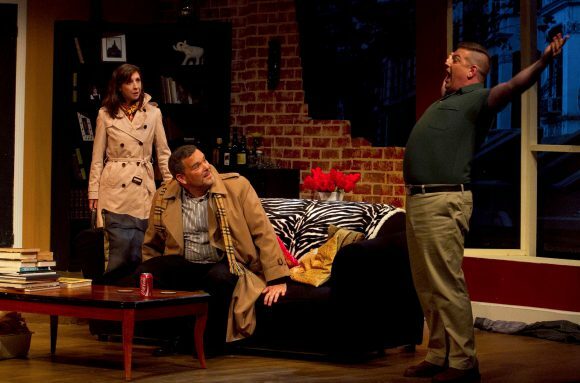 Cindy Beaton’s Veronica is the perfect passive-aggressive, controlling woman we all know (and dislike), trying to rein in her dissatisfied husband Michael (Allan Ross) as he turns to rum and cigars. Anyone can relate to Annette’s (Jane Chambers) frustration as her lawyer husband Alan (Patrick McIntyre) just can’t seem to put his cell phone down. Great acting or otherwise, watching adults behave childishly onstage might be cathartic to some. It just isn’t hugely entertaining. But that’s just my opinion and I would love to know what you think? Did you find the poorly behave adults entertaining? Was there something in the themes of the show that stood out or spoke to you? Join the discussion and let me know in the comments below.